Low muscle tone, also called hypotonia, is a diagnosis given when a child makes loose and uncontrolled movements. Additional symptoms associated with hypotonia include poor coordination, muscle weakness and motor-skills delays. Hypotonia may stem from a medical problem, such as Down syndrome and hypothyroidism, or may have no recognizable cause. An occupational therapist helps you plan activities to do with a child who has low muscle tone. Children who demonstrate low muscle tone in the mouth and facial areas may benefit from oral-motor activities. When the child is able to gain better control over his mouth movements, he may improve his speech and language development. It can also be helpful for the prevention of choking. Using whistles and straws along with chewing on crunchy foods such as carrots and celery are typically recommended oral-motor activities. Warming up the muscles with fun activities can be helpful for children with low muscle tone. For instance, the Department of Occupational Therapy at Royal Children's Hospital in Australia recommends that the child bounce on a trampoline for several minutes before sitting at a desk. This activity improves posture. Playing with clay before writing can improve grip and fine motor skills while holding a pencil. Certain exercises can be done to activate multiple muscle groups at once. For instance, star jumps are a fun exercise that simultaneously works the muscles in the upper and lower body. To do a star jump, the child must lift both arms while jumping. She should land with her feet approximately hip-width apart. Recommend 10 star jumps at a time for the child. If the low muscle tone is affecting his fine motor skills, craft activities can be done at home. Have the child draw shapes and color between the shapes he has drawn. 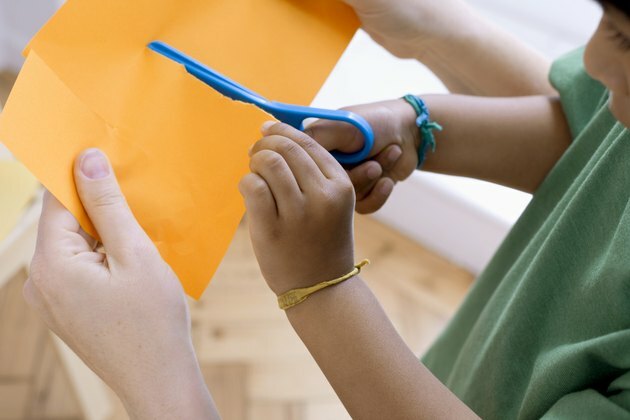 Paper cutting with safety scissors is another important activity for a child with low muscle tone. Have him cut out shapes drawn on construction paper. BabyCenter: What Is Low Muscle Tone and What Does It Mean?